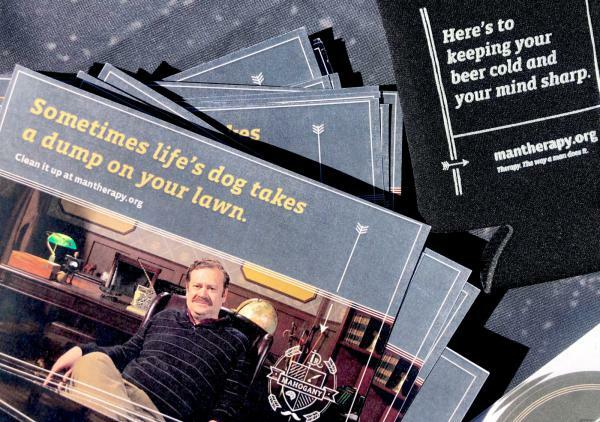 Man Therapy cards and koozies at a recent El Paso County event. Between 2004 and 2017, more people died by suicide in El Paso County, a populated area that is home to multiple military bases and Colorado Springs, than in any other county in the state. Last year, 75 percent of those people were men. That’s why county health officials are trying to reach men before their crisis point through “Man Therapy.” The slightly crass, tongue-in-cheek public health program lives largely online, in the form of a slick website that aims to first draw in men with funny videos and witty graphics — and then offer them mental health resources. Colorado state health officials created the Man Therapy program six years ago. Now, El Paso County has launched a year-long campaign featuring billboards, TV ads, promotional events and posters tacked up in the men’s bathrooms of bars and restaurants as well as holding promotional events. As part of the county’s campaign to reach men before the crisis point, Sgt. 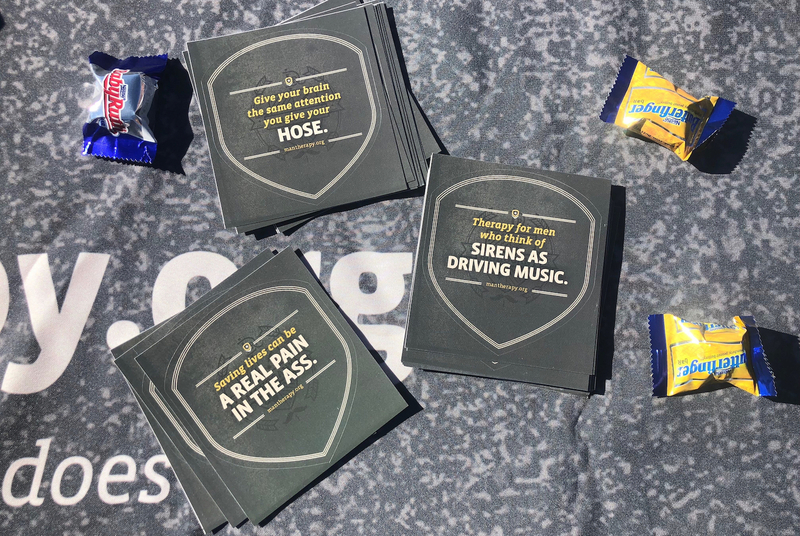 Jason Garrett, with the El Paso County Sheriff’s Office and Kelsey Leva, the Youth Health Development Planner attended a tailgating event on a recent Saturday. Sgt. 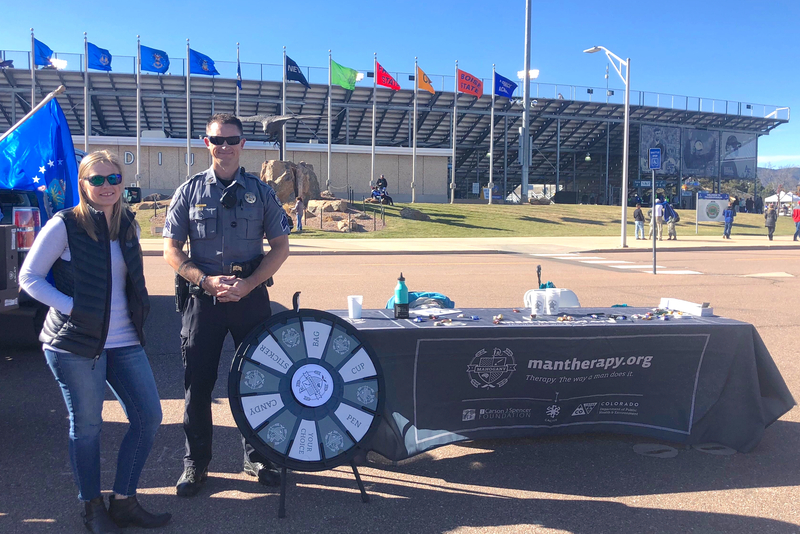 Jason Garrett, with the El Paso County Sheriff’s Office and Kelsey Leva, the Youth Health Development Planner for El Paso County Public Health, spent a recent sunny Saturday afternoon talking about the program at the tailgate before an Air Force football game. In his role as a supervisor in the Patrol Division, Garrett says that he encounters suicide-related issues daily, oftentimes through welfare check calls that come in through the 911 system. He lists contributing factors like mental illness, isolation, poverty and drugs. Years later, in 2012, Man Therapy was born. Other states including Ohio and Arizona, have licensed it, as has the country of Australia. Silicon Valley tech companies have recently expressed interest. “As you can imagine, stress in that world is off the charts, and getting individuals to reach out for support is a challenge,” Nathaan Demers, Vice President of Grit Digital Health, one of the organizations behind Man Therapy, said. Despite enthusiasm from many public health officials, the impact of the program is unclear. The Man Therapy website has not hit its pageview goals, a shortcoming that the Colorado Department of Public Health attributes to limited funding. The state is collecting user feedback and testimonials but doesn’t have hard data yet on program outcomes. The Centers For Disease Control and Prevention is funding a four-year research study evaluating the effectiveness of the program, slated to be published next Fall. People laughed out loud at the Man Therapy sayings printed on cards that were on display at a recent Air Force football game. There is a lot more where that came from on the Man Therapy website. Much of the content revolves around Dr. Rich Mahogany, a fictitious doctor described as “part-football coach, part-drinking buddy and 100 percent action hero.” From the homepage, he greets visitors from his leather chair, cleans up his desk with a leaf blower, and cracks up while reading a chainsaw operator’s manual. Once they have had their fill of Dr. Rich Mahogany’s videos, visitors can take a mental health quiz, find a therapist nearby and watch testimonials from men who have struggled with their own mental health issues. “If your ultimate goal is to reduce suicide, you cannot do that in any significant degree without doing something about middle-aged men killing themselves,” Dr. Leon Kelly, Deputy Chief Medical Examiner in El Paso County said. For the last 13 years, El Paso County has had the highest number of suicides of any county in Colorado. With all of those numbers in mind, Kelly said that previous suicide prevention programs, like crisis phone lines, were not enough. So, the county started looking into new campaigns. 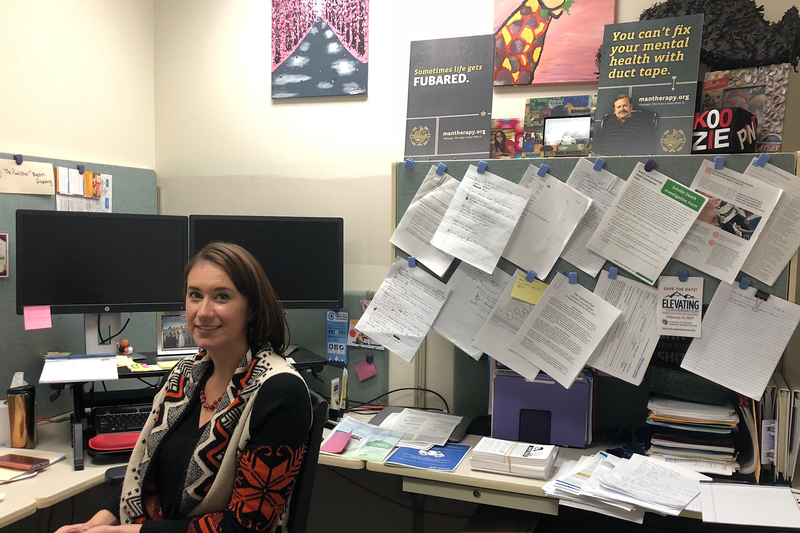 Sarah Brummett, Director of the Office of Suicide Prevention, has Man Therapy materials all over her office, from posters to a fake beer advertisement. Some of the decision-makers were skeptical. Afterall, Man Therapy presents one very specific macho kind of manliness. 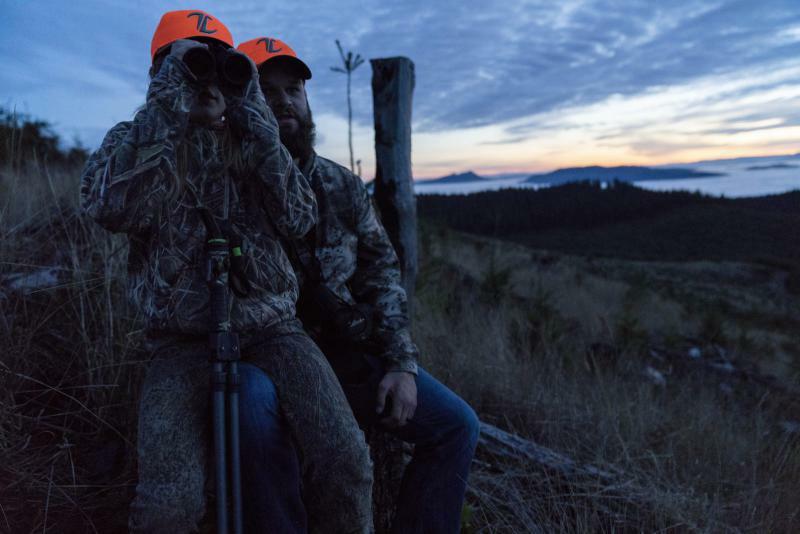 Editor's note: This story includes graphic imagery and language. 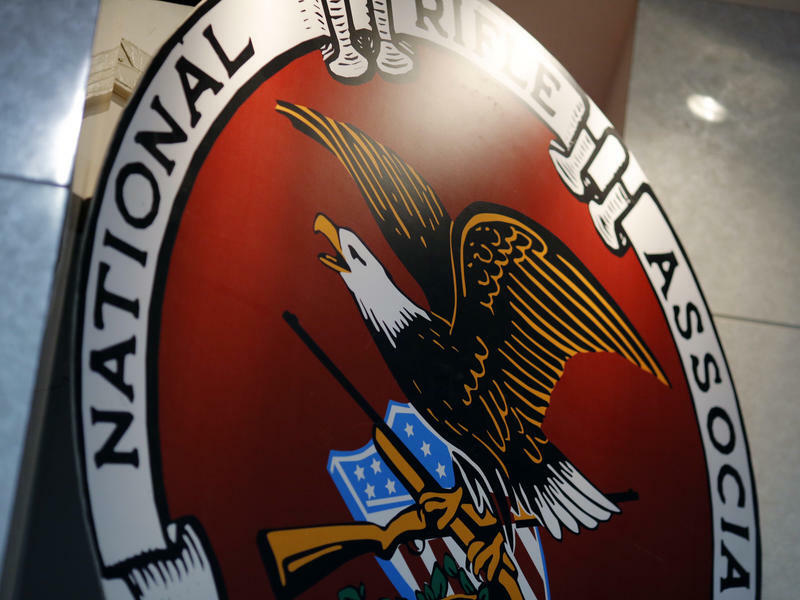 A mocking tweet from the National Rifle Association has stirred many physicians to post on social media about their tragically frequent experiences treating patients in the aftermath of gun violence.